Time to sell your Four C's condo? Read about today's resort-market condo buyer. 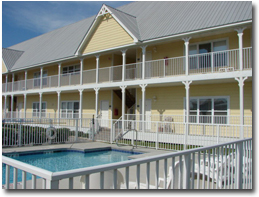 Four C's condominium is located in the West Beach area of Gulf Shores, Alabama. The property consists of eleven individual units built in 2006 and they are just under three miles west of the intersection of Highway 59 and Beach Boulevard. The property has a pool, BBQ area, and deeded beach access. The Four C's condominium is comprised of two- and three-bedroom units that range in size from over 900 square feet to 1,480 square feet. These condos are conveniently located to numerous restaurants, bars, shopping, and entertainment venues. If you have any further questions, need info or would like to schedule a private viewing for the Four C's condominium in Gulf Shores or any other condo or property, please email info@condoinvestment.com or call 251-Area-Pro (251-273-2776) for immediate assistance. Read our RENTAL TIPS to help increase your Four C's rental revenue. Our Condo Revenue page offers info for annual rental incomes for the Four Cs and all other Gulf Shores condos.